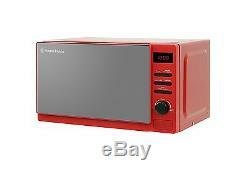 Russell Hobbs 20 L Rosso Digital Microwave With Colours Plus Kettle, 3000 W, 1.7 L And Colours Plus 2-Slice Toaster - Red. Sets are also available in different colours and with different options and items, please visit our store to see the full range of. Microwave, Kettle and Toaster Sets and much more! Please note that, while Kettle and Toaster are an exact match, the Microwave has a different shade of red. Russell Hobbs RHM2079RSO Rosso Digital Microwave, 20 L - Red. The RHM2079RSO is a stylish everyday microwave designed with practicality in mind. The RHM2079RSO has a generous 20 litre capacity and has a simple to use button & dial operation system. With 5 selectable power levels, you can tailor your cooking experience. Other features include auto menu options and defrost functions. The glass turntable is also removable & easy to clean. Russell Hobbs 20412 Colours Plus Kettle, 3000 W, 1.7 L - Red. Rapid boil zone feature - You can boil 1 cup in 45 seconds by boiling 1 cup (250ml) vs. Pull to open hinged lid. Russell Hobbs 23330 Colours Plus 2-Slice Toaster - Red. 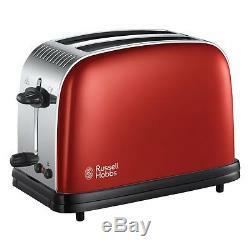 Up to 50% faster toasting vs Russell Hobbs Colours Red Toaster, No. Lift and Look feature - so you can check your toast without cancelling the cycle. Frozen bread function, cancel function & variable browning control. ALL ITEMS SENT BY INSURED & TRACKED COURIER. Our customer service team is more than happy to answer you within 24 hours. For multiple products we might use different suppliers for the same order, therefore it may happen the items are delivered on different days according to the supplier, but always by the term given. This allows our products to remain very competitively priced. We may also re-use packaging when appropriate as an attempt to reduce our overall environmental impact on the planet. These items may be dispatched directly to you from a third party distributor. We know how important it is for you to get what you ordered and get it fast. Our products are a 100% authentic. We work with the biggest suppliers of high quality products to bring you only the best items. We consider it a top priority that our customers are happy and in the rare event that they are not, we do everything we can to fix the situation. No customer will walk away from our store unhappy. If there's a problem, just let us know and we fix it. We guarantee you only the best experience when shopping with us! You will be notified on the day that your items have been dispatched. When returning an item, it must be in all of the original packaging and include all of the original accessories or items that came with it. The item and package should be in original and perfect condition. We do our best to process as quickly as possible. We request you to try your new item/s as soon as you receive them. Please note that any pre-existing damage of the received item/s MUST be communicated within 24 hours after the item has been received; failure to do so may result in us (on our supplier's behalf) not granting you the return. If the item in your opinion doesn't correspond to pictures and/or descriptions, you MUST inform us within 24 hours after the item has been received; failure to do so may result in us (on our supplier's behalf) not granting you the return. If you changed your mind about the item, but nothing is wrong with the item itself e. It works properly and perfectly corresponds to pictures and descriptions, we (on our supplier's behalf) may not grant you the return. Looking for a matching colour microwave, kettle toaster set or other matching colour appliances for your kitchen? You're in right place, we're also creating custom appliances sets for your requirements. And we'll answer you within 2 hours or choose colour or style below to see our full range of microwave kettle & toaster sets or other coloured kitchen appliance sets. Check out my other listings. 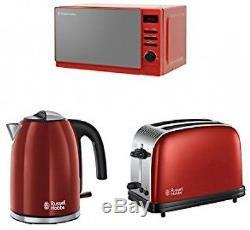 The item "Russell Hobbs Rosso Microwave Metallic Red Colours Plus Kettle & 2 Slice Toaster" is in sale since Sunday, October 23, 2016. This item is in the category "Home, Furniture & DIY\Appliances\Coffee, Tea & Espresso Making\Kettle & Toaster Sets". The seller is "*microwave-kettle-toaster-sets*" and is located in London.